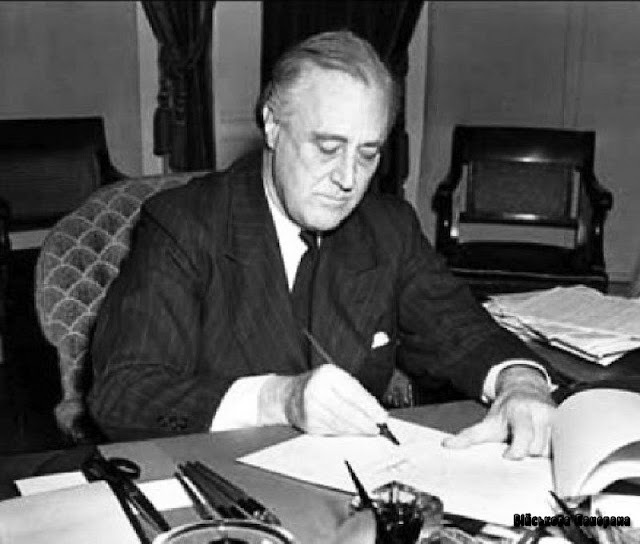 President Roosevelt signs the Lend Lease Bill, one of the most consequential laws of the 20th Century (Library of Congress). Italian/Greek Campaign: The Italian Primavera Offensive continues on 11 March 1941. However, what little impetus the attack managed on its first two days is now gone. The center of the offensive, at Monastery Hill, is proving an immovable barrier to the Italians. The Italian Puglie Division attempts to flank Monastery Hill, but this fails and the division is withdrawn and replaced with the Bari Division. East African Campaign: The British at Keren continue to build their forces for another attempt to take the town. Much further south, British forces continue to move further through barren country toward Addis Ababa. The Luftwaffe also bombs Portsmouth during the night of 10/11 March. The German bombs kill ten Royal Navy officers and damages destroyer HMS Witherington at its jetty. The Witherington has to be beached on a mudflat, and is later repaired. Destroyer HMS Tynedale also is damaged by near misses, but the repairs are effected in just nine days. Destroyer HMS Sherwood also is damaged. Minesweeping trawler HMT Revello is sunk (one death), but later refloated and repaired. Four other minesweeping trawlers and monitor Marshall Soult also are damaged. During the day, the Luftwaffe attacks shipping in the North Sea and damages destroyer HMS Cattistock. The German aircraft also damage 7900 ton British ship Royal Star at Stonehaven, and sink 163 ton British trawler Aberdeen in Cardigan Bay (8 men killed). RAF Bomber Command raids Kiel during the night with 27 bombers. Winston Churchill and US Ambassador, John G. Winant sign the Lend-Lease Agreement, London, 11 March 1941 (Australian War Memorial). Battle of the Atlantic: Operation Berlin, the Atlantic cruise of German cruisers Scharnhorst and Gneisenau, continues. While not sinking a lot of ships, the cruisers' mere presence in the Atlantic is scrambling Royal Navy deployments. Far out in the Atlantic, the cruisers rendezvous with tankers Ermland and Uckermark. The operation's commander, Admiral Lütjens, holds a conference on his flag ship, the Gneisenau, with the captains of all of the ships. Lütjens then receives a message from Berlin: proceed to Brest, France. The reason for this (which means crossing the convoy routes again) is to provide a diversion for a contemplated breakout into the Atlantic of heavy cruisers Admiral Scheer and Admiral Hipper. In addition, the Operation Berlin cruisers can prepare in port for the expected breakout later in the spring of battleship Bismarck and cruiser Prinz Eugen. Once all of the German heavy ships are together in the Atlantic, they will constitute an overpowering force - at least, that is the plan. U-106 (Kptlt. Jürgen Oesten) is operating 370 km west of Cape Blanco, French West Africa when it spots 7506 ton British ore freighter Menmon. At 15:46, Oesten pumps a torpedo into the ship's starboard side. The 62-man crew immediately abandons ship, which sinks quickly as is typical with ships with heavy cargo. Oesten pumps a second torpedo into Memnon, which sinks after fifteen minutes. There are four deaths (five if counting a man lost on the journey to shore), and many of the survivors in two lifeboats make a heroic journey to Dakar and Sierra Leone. Four survivors eventually are picked up by Gneisenau. This is the start of an extraordinarily successful second patrol by U-106. U-37 (Kptlt. Asmus Nicolai Clausen) spots an Icelandic trawler, 97 ton Frodi, about 200 miles (300 km) southeast of Reykjavik. Clausen opts not to waste a torpedo on the small fishing trawler and surfaces to give his crew some practice with the deck gun. The gun does a lot of damage, killing five crew, but the Frodi escapes and makes it back to Reykjavik. German torpedo boats remain active in the waters off Great Yarmouth. S-28 attacks local Convoy FS 32 and sinks 5257 ton British freighter Trevethoe. There is one death. Convoy HX 114 departs from Halifax, Convoy BHX 114 departs from Bermuda. Royal Navy destroyer HMS Offa is launched and corvette HMS Pennywort is laid down. 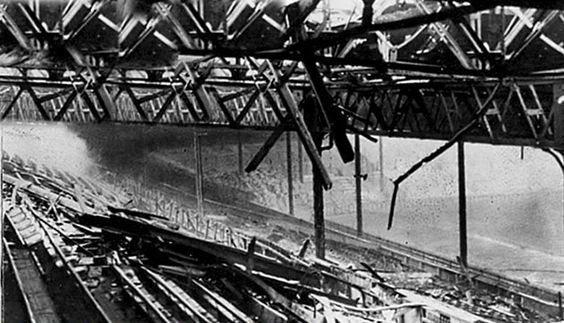 Damage to Old Trafford due to the bombing of 11 March 1941. The stadium will not be repaired and reopened until 1949. Battle of the Mediterranean: General Rommel, commander of the Afrika Korps, flies back to Germany for a meeting with Hitler at the Fuhrer Headquarters. He learns that his 5th Light Division, now largely in place in Tripoli (its Panzer regiment unloads in Tripoli today), soon will be joined by the 15th Panzer Division. Once both divisions are fully assembled, Rommel is to advance eastward and recover Benghazi. Already, the Germans have 150 tanks in Tripolitania. Pursuant to Hitler's 18 February 1941 decision, the tanks have been up-gunned to carry 50-75 mm guns. The antiaircraft forces have 88 mm guns which can double as land artillery or even, in exceptional emergency cases, anti-tank weapons. The RAF raids Tripoli and its harbor area. Other planes attack Italian/German installations throughout Tripolitania. The RAF also attacks the Italian bases at Rhodes. Greek destroyer Psara claims the sinking of an Italian submarine off Falconera. However, it is unclear what, if any, ship it sank. At Malta, the Luftwaffe launches a heavy raid against Sliema, a residential district on the west coast that has received little attention in the war so far. There are 21 deaths and 16 badly wounded. Convoy AS 18 departs from Piraeus, Convoy AN 19 departs from Alexandria, Convoy BS 18A departs from Port Sudan, Convoy BS 19 departs from Suez. Anglo/US Relations: With the Lend Lease Bill finally having made it through Congress after lengthy debate, President Roosevelt signs Public Law 11 of the 77th Congress into law at 15:50 in the afternoon. The law in its initial form grants the President the power to authorize $7 billion in shipments of war goods without payment by the recipients or anyone else - at least not until the recipients are able to pay. This is a dramatic reversal of the Neutrality Act of 1939, when munitions shipments were banned. Long expecting passage, the US Army and Navy immediately begin shipping items to Great Britain. While the British are the prime recipients of aid under the bill, it is not limited to Great Britain. China, Greece and other opponents of Hitler present and future (such as the Soviet Union) also are eligible for aid under the terms of the law (once they actually are opposing Hitler, which the USSR is not as of yet). Roosevelt wastes no time: he almost immediately sends Congress an order for the full $7 billion in war material. Averell Harriman is President Roosevelt's latest personal envoy to Great Britain. He leaves by air for London. Terrorism: Great Britain's former Envoy Extraordinary and Minister Plenipotentiary to Bulgaria George William Rendel is in Istanbul following the severing of diplomatic relations betweens the two countries (Rendel is ultimately heading to a similar post in Yugoslavia). He is just settling into his room in the Pera Palace Hotel, with his luggage still in the baggage room, when there is a tremendous explosion. Rendel's daughter Ann is slightly injured and four others are killed due to a bomb planted in Rendel's luggage. Aleksandr Mikhaylovich Vasilevsky during the war. 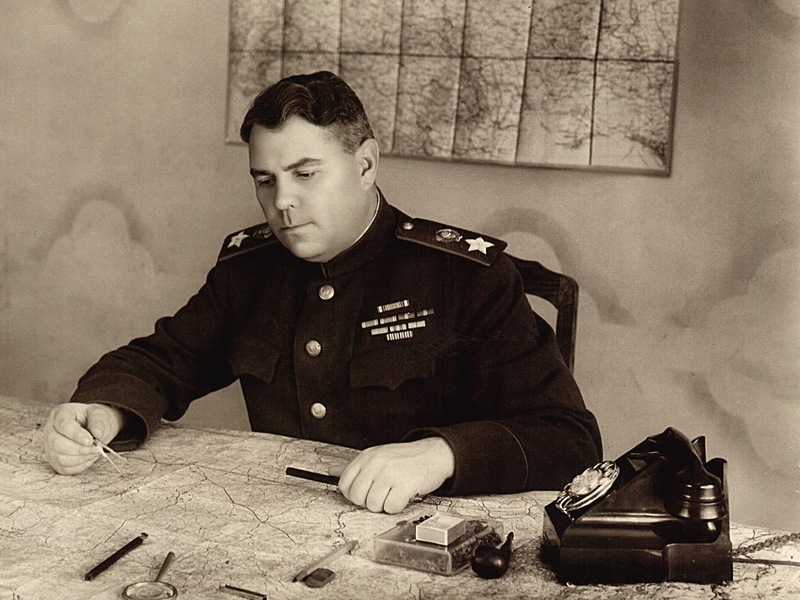 Soviet Military: The Stavka (Soviet High Command) continues to plan for an offensive west into German territory upon the outbreak of war (which is assumed to be initiated by the Germans). In the latest Strategic Deployment Plan, Deputy Commander of the Operations Directorate of the General Staff Aleksandr Vasilevsky proposes to put the main Soviet weight in the direction of southern Poland. Somewhat prophetically, the plan envisages hostilities beginning on 12 June 1941. The Germans, meanwhile, are weighting their north and south prongs heaviest, while leaving the center - the area Vasilevskiy proposes to attack the hardest - relatively weak. Timoshenko, Zhukov and Molotov meet with Stalin to discuss how to orient the troops. Belgium: Jews are required to register for forced labor. Yugoslavia: Reflecting the unsettled nature of politics in the country, there are anti-German demonstrations in Belgrade. Indochina: Today is the official signing of the Frontier Agreement between the Vichy French and the Thai government. Symbolically, the agreement is completed aboard a Japanese warship in the Gulf of Siam. While the Thais get all the territory in Laos and Cambodia on the right side of the Mekong River that they originally sought, the Japanese are the real winners: they get basing rights for their planes at Saigon, a monopoly on Indochinese rice production, and a chance to show the world who really dominates the Far East. China: The Western Hupei Operation basically ends as a great success for the Japanese. 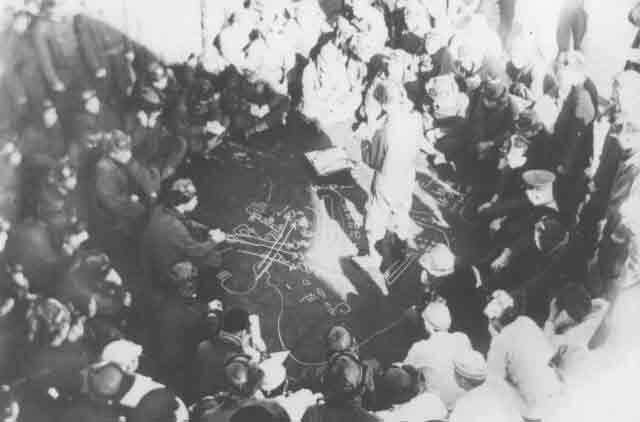 The 13th Division has chased the Chinese back toward Chunking and devastated a large area to the south and west of the Yangtze River. Many civilians perish during such terror raids, which the Japanese specialize in. London is drab and grey. There is a tough and determined spirit, but the colour and gaiety have gone. In squares like Berkeley Square, houses ruined, windows boarded up. The shops everywhere with windows reduced to peep holes.... One feels the hurry and pressure of events. Sandbags in the doorways, ground floor windows bricked up; death around the corner. No more leisurely strolling about the Charing Cross Road book shops or sauntering in Piccadilly. But enough! Menzie is extremely popular in London as a sort of possible alternative to Prime Minister Winston Churchill. Not everybody is enamored with Churchill's single-minded obsession with orienting the entire country in a deathmatch with Hitler. Menzies drops a hint today in his diary that some are almost desperate for an alternative: he writes down that newspaperman Ronald Cross pleads with him, "We must not let you leave this country!" In fact, Menzies will remain in London for months, but he has no real power there and recognizes the authority of Churchill. American Homefront: Football star Bronislau "Bronko" Nagurski, also a championship wrestler, regains his National Wrestling Association world title from Ray Steele. Ray Steele, wearing the National Wrestling Association title belt that he has just won from Bronko Nagurski in March 1940. 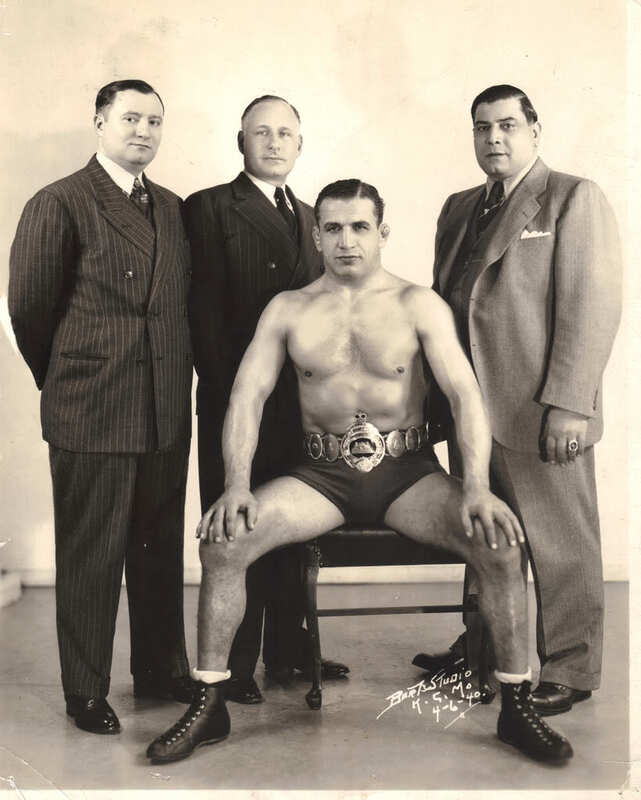 This is the belt that he loses back to Nagurski today, 11 March 1941. The other gentlemen in the photo are subject to some debate, but apparently the fellow on the right is Col. Harry J. Landry, first president of the NWA.